The initial deadline to register for New York City’s Sandy aid program is September 30. But what about those who don’t want to “Build it Back”? 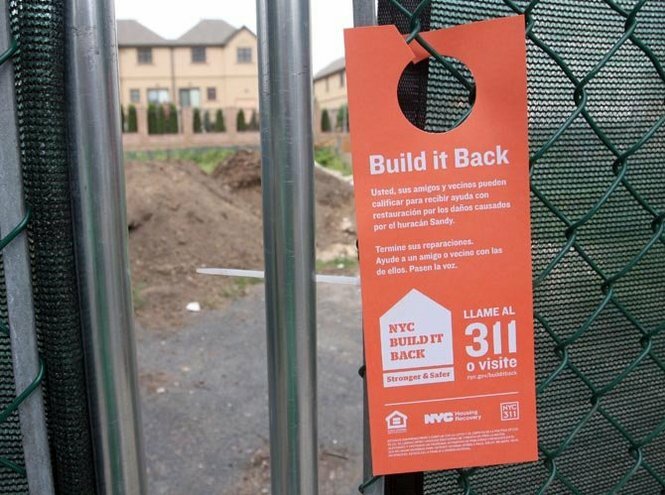 Mayor Bloomberg didn’t announce the Build it Back program until June 3, more than seven months after Sandy struck the East Coast. Build it Back offers eligible homeowners funding for repairs or rebuilding, as well as the option to sell property to the city or the state through an acquisition/buyout. The city has spent the summer promoting the program and encouraging affected residents to register. This has proved difficult, however; while an estimated 70% of eligible New York City residents had registered by early last month, registration rates were significantly lower (below 40%) in three heavily affected zip codes on Staten Island. While these rates can be attributed to cynicism, confusion, or a simple lack of awareness, to understand reactions to the city’s program on Staten Island it is helpful to consider the experience of residents who have decided they don’t want to rebuild their homes. Since Sandy, the dominant narrative has been that people will want to rebuild their homes regardless of future risk. On Staten Island, however, many residents tell a different story. In the neighborhood of Oakwood Beach, for instance, a group of nearly two hundred homeowners met shortly after Sandy and collectively decided they wanted to move, rather than rebuild. Together, they successfully lobbied for a government buyout of the neighborhood. Governor Cuomo declared their homes part of an “enhanced area” that the state will convert to a public park or wetlands to protect from future flooding and storm surge. Soon after Governor Cuomo’s January announcement of his intention to buy out damaged houses, hundreds of other homeowners along the South and East Shores of Staten Island formed groups to press for buyouts in their own areas. State officials spent the spring explaining the buyout program at community meetings across Staten Island. I recently interviewed one senior state official who spoke at many of these meetings. “The city didn’t have a plan at that time…so the state was the only gig,” he told me. It quickly became clear, however, that the city wanted to provide an alternative to the state buyouts. “The city is vehement about wanting to redevelop the waterfront,” the official explained, but state buyouts prohibit building on purchased land. The city’s Build it Back program, in contrast, offers residents an “acquisition for redevelopment” rather than a buyout. While the state-led buyout will pay homeowners the pre-storm value of their property, the city-led acquisition will pay the post-storm value, although the city says it intends to make up the difference through some form of relocation assistance. Liz Koslov is a PhD student in Media, Culture, and Communication at NYU. She is researching the buyout process on Staten Island as part of a dissertation on urban “managed retreat” and civic responsibility. Matthew Schuerman, “City’s Sandy Aid Program for Homeowners 3 Months Behind Schedule.” WNYC News, 6 Aug 2013. Jillian Jorgensen, “Build it Back Program a Hard Sell for Some Staten Island Hurricane Sandy Victims.” Staten Island Advance, 1 Aug 2013. See, for instance, Thomas Kaplan, “Homeowners in Flood Zones Opt to Rebuild, Not Move,” New York Times, 26 Apr 2013.